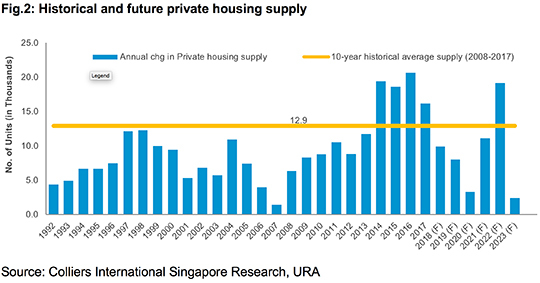 The fresh property cooling measures – higher additional buyer’s stamp duty (ABSD) and lower loan-to-value (LTV) limit – announced by the Singapore Government on 05 July took the market by surprise as recent trends suggest that the private residential market is finding its own equilibrium: developers have been less active in the collective sale market, while new homes sales at some recent launches have moderated. The introduction of these fresh property cooling measures a year into market recovery, after four years of decline, was aimed at calming the euphoria in the private residential sector. Home prices had risen by 3.9% in Q1 2018, and another 3.4% in Q2 according to flash estimates. The price growth – which is expected to taper in the quarters ahead – was largely driven by the brighter economic outlook, pent-up housing demand and more positive market sentiment. Colliers International believes the fresh property cooling measures – the ninth round of property cooling initiatives since 2009 – will put a drag on home sales this year as the higher ABSD could curtail investment demand from both locals and foreigners, and the larger cash outlay required for down payment on homes weighs on buying interest. But Colliers International said, the flurry of last minute deals done – estimated at 1,000 units from three project launches – The Stirling Residences, Park Colonial and Riverfront Residences – on the evening of July 05 to beat the ABSD deadline indicated that there is both liquidity and pent-up demand for units in the market. The real estate firm expects new home sales to decline significantly in the initial few months as the market take stock of the potential implications. The last two rounds of cooling measures announced in January 2013 and June 2013 saw new home sales fall 65% to 712 units in February 2013 and 73% to 482 units in July 2013 respectively. They expect developers to delay launches as they re-strategise after the fresh property cooling measures were implemented. 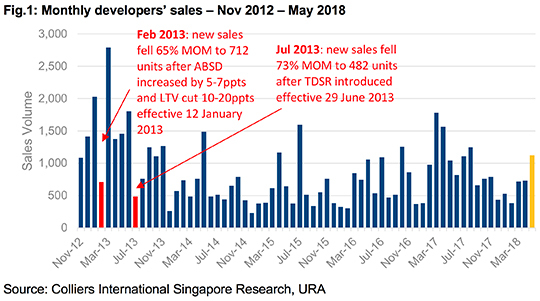 From January to May 2018, developers have sold 3,434 new units based on caveats lodged. Colliers International’s research found that private home supply completions will taper off sharply in 2018-2021F to an annual average of 8,104 units from the 2014-2017 annual average of 18,731 units, and the 10-year average of 12,948 units. While this number could rise sharply beyond 2022 due to the recent collective sale fever, it does not appear excessive if spread over a longer term. We expect annual average completions of 10,318 units over 2018-2022. Colliers International’s data showed that 21 collective sale tenders valued at a total $5.6 billion which closed in May and June were not sold as developers take a breather from the market to assess the large number of redevelopment sites available, evaluating any potential risks and taking stock of their development pipeline. Developers are expected to be more selective in land purchase – wary of the hefty 25% ABSD remission clawback if they fail to develop and sell all units with five years of acquiring the site – but Colliers International believes that redevelopment sites in mature estates or areas where there have been few new launches could still be appealing. 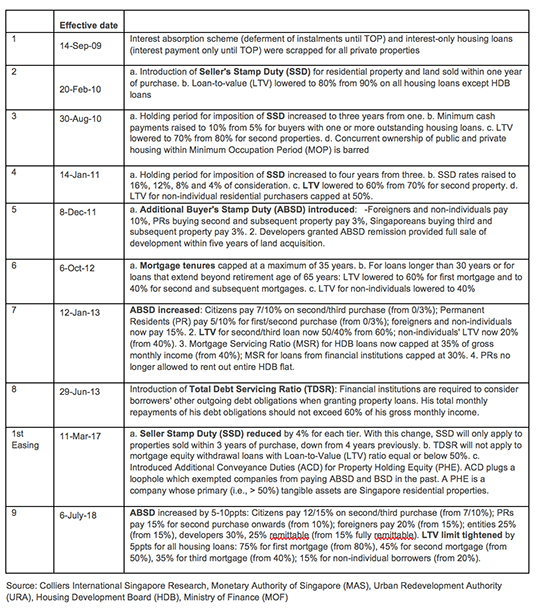 If you are home-hunting and wonder if the fresh property cooling measures will affect you, our Panel of Property agents and the mortgage consultants at icompareloan.com can help you analyse its effect for you.